'Zodiac" is the "All the President's Men" of serial killer movies, with Woodward and Bernstein played by a cop and a cartoonist. It's not merely "based" on California's infamous Zodiac killings, but seems to exude the very stench and provocation of the case. The killer, who was never caught, generously supplied so many clues that Sherlock Holmes might have cracked the case in his sitting room. But only a newspaper cartoonist was stubborn enough, and tunneled away long enough, to piece together a convincing case against a man who was perhaps guilty. The film is a police procedural crossed with a newspaper movie, but free of most of the cliches of either. Its most impressive accomplishment is to gather a bewildering labyrinth of facts and suspicions over a period of years, and make the journey through this maze frightening and suspenseful. 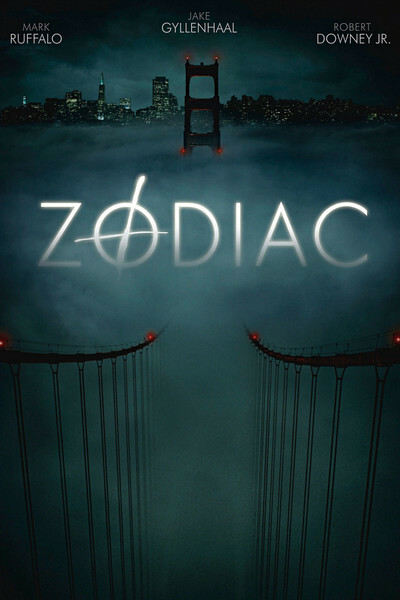 I could imagine becoming hopelessly mired in the details of the Zodiac investigation, but director David Fincher ("Seven") and his writer, James Vanderbilt, find their way with clarity through the murk. In a film with so many characters, the casting by Laray Mayfield is also crucial; like the only eyewitness in the case, we remember a face once we've seen it. The film opens with a sudden, brutal, bloody killing, followed by others not too long after -- five killings the police feel sure Zodiac committed, although others have been attributed to him. But this film will not be a bloodbath. The killer does his work in the earlier scenes of the film, and then, when he starts sending encrypted letters to newspapers, the police and reporters try to do theirs. The two lead inspectors on the case are David Toschi (Mark Ruffalo) and William Armstrong (Anthony Edwards). Toschi, famous at the time, tutored Steve McQueen for "Bullitt" and was the role model for Clint Eastwood's Dirty Harry. Ruffalo plays him not as a hotshot but as a dogged officer who does things by the book because he believes in the book. Edwards' character, his partner, is more personally worn down by the sheer vicious nature of the killer and his taunts. At the San Francisco Chronicle, although we meet several staffers, the key players are ace reporter Paul Avery (Robert Downey Jr., bearded, chain-smoking, alcoholic) and editorial cartoonist Robert Graysmith (Jake Gyllenhaal). These characters are real, and indeed the film is based on Graysmith's books about the case. I found the newspaper office intriguing in its accuracy. For one thing, it is usually fairly empty, and it was true on a morning paper in those days that the office began to heat up closer to deadline Among the few early arrivals would have been the cartoonist, who was expected to work up a few ideas for presentation at the daily news meeting, and the office alcoholics, perhaps up all night, or already starting their recovery drinking. Yes, reporters drank at their desks 40 years ago, and smoked and smoked and smoked. Graysmith is new on the staff when the first cipher arrives. He's like the curious new kid in school fascinated by the secrets of the big boys. He doodles with a copy of the cipher, and we think he'll solve it, but he doesn't. He strays off his beat by eavesdropping on cops and reporters, making friends with the boozy Avery, and even talking his way into police evidence rooms. Long after the investigation has cooled, his obsession remains, eventually driving his wife (Chloe Sevigny) to move herself and their children in with her mom. Graysmith seems oblivious to the danger he may be drawing into his home, even after he appears on TV and starts hearing heavy breathing over the phone. What makes "Zodiac" authentic is the way it avoids chases, shootouts, grandstanding and false climaxes, and just follows the methodical progress of police work. Just as Woodward and Bernstein knocked on many doors and made many phone calls and met many very odd people, so do the cops and Graysmith walk down strange pathways in their investigation. Because Graysmith is unarmed and civilian, we become genuinely worried about his naivete and risk-taking, especially during a trip to a basement that is, in its way, one of the best scenes I've ever seen along those lines. Fincher gives us times, days and dates at the bottom of the screen, which serve only to underline how the case seems to stretch out to infinity. There is even time-lapse photography showing the Transamerica building going up. Everything leads up to a heart-stopping moment when two men look, simply look, at one another. It is a more satisfying conclusion than Dirty Harry shooting Zodiac dead, say, in a football stadium. Fincher is not the first director you would associate with this material. In 1992, at 30, he directed "Alien 3," which was the least of the Alien movies, but even then had his eye ("Alien 3" is one of the best-looking bad movies I have ever seen). His credits include "Se7en" (1995), a superb film about another serial killer with a pattern to his crimes; "The Game" (1997), with Michael Douglas caught in an ego-smashing web; "Fight Club" (1999), beloved by most, not by me; the ingenious terror of Jodie Foster in "Panic Room" (2002), and now, five years between features, his most thoughtful, involving film. He seems to be in reaction against the slice-and-dice style of modern crime movies; his composition and editing are more classical, and he doesn't use nine shots when one will do. (If this same material had been put through an Avid to chop the footage into five times as many shots, we would have been sending our own ciphers to the studio.) Fincher is an elegant stylist on top of everything else, and here he finds the right pace and style for a story about persistence in the face of evil. I am often fascinated by true crime books, partly because of the way they amass ominous details (the best I've read is Blood and Money, by Tommy Thompson), and Fincher understands that true crime is not the same genre as crime action. That he makes every character a distinct individual is proof of that; consider the attention given to Graysmith's choice of mixed drink.